In physics it’s often said that there are four fundamental forces: gravity, electromagnetism, strong, and weak. The reason we list them as four forces has a bit to do with the history of our understanding of them. In the 1700s, the forces of electricity and magnetism were considered to be separate, but by the mid 1800s James Clerk Maxwell unified them into a general theory of electromagnetism. Soon general relativity was first validated, a unified theory of electromagnetism and gravity known as the Kaluza-Klein model was developed. This classical model ran into difficulties integrating with quantum theory, so the model fell out of favor. Later, electromagnetism was unified with the weak to form the electroweak model, but since their unified behavior only appears at high energies we continue to treat them as distinct forces. Most people are familiar with gravity and electromagnetism in their daily lives, while the strong force holds atomic nuclei together, and the weak … something something … radioactivity. 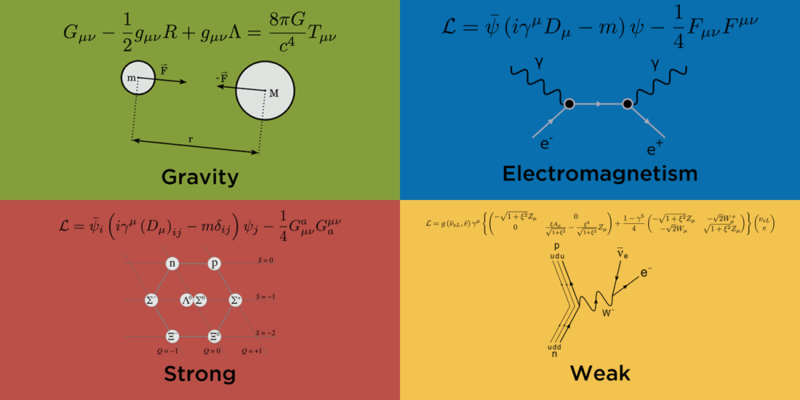 Even many physics majors aren’t given more than a cursory overview of the strong and weak forces, so while we all know the list, we’re less clear in describing them. While some fields of study can get away with focusing on one or two of these forces, all four of them are central to astrophysics. We’ll start with gravity first. It’s the force everyone knows, but no one fully understands. It all starts tomorrow. Also really looking forward to this. I hope you can also point us to some books on all four topics ranging from popular to professor. Particularly books on the weak and strong forces are hard to find. +Blake and + Orion Nija’d me; I’m actually excited about this, specially the weak and strong forces. Excited! That’s what I need, sir hahah! Although the Kaluza-Klein has fallen out of favor, the ideas it introduced ideas that are still used today.